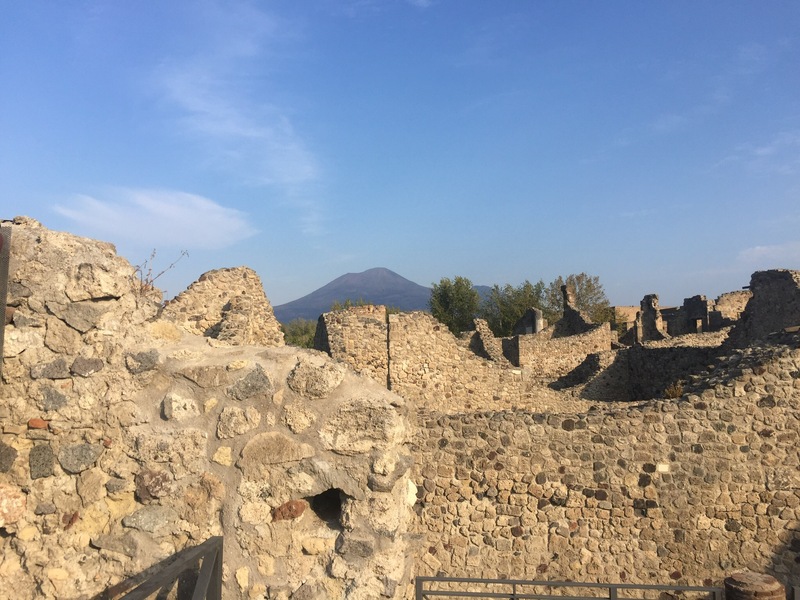 Looming over Pompeii is Vesuvius , the volcanic mountain visually dominates the ruins of the ancient city. While Vesuvius is known to have erupted more than fifty times (and maybe again soon), one eruption stands out among the rest. 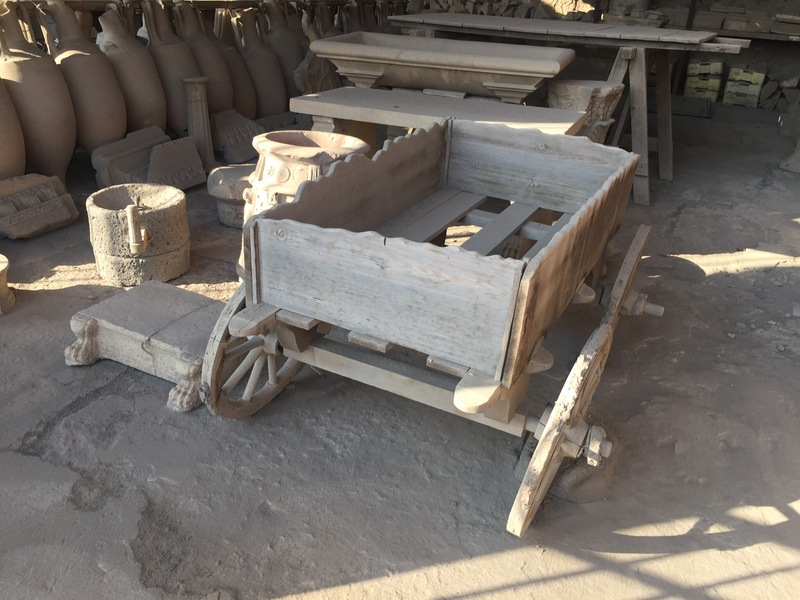 That is the 79 A.D. event when Vesuvius destroyed the city of Pompeii with a blanket of volcanic ash and super-heated rocks, both destroying and preserving the city with a blanket of volcanic ash 25 metres deep. The eruption killed around a thousands people and buried the entire city, which was eventually forgotten until it was unearthed by explorers 1800 years later. 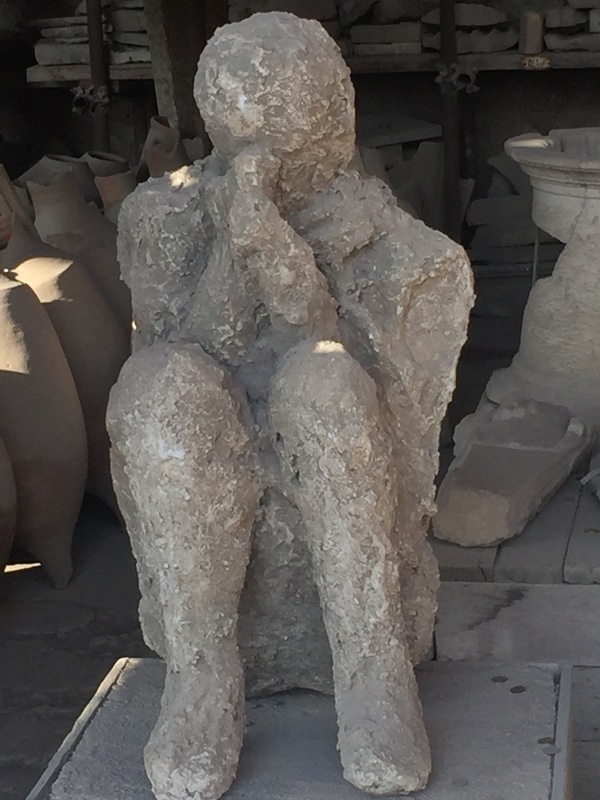 The story of what happened in Pompeii, as you walk over the cobblestones that are still worn with the traces of horse-drawn carts, admire handmade intricate mosaic sidewalks, explicit murals and rough graffiti, and most of all when viewing the plaster death casts made of the victims in their final moments of life – becomes shockingly real. 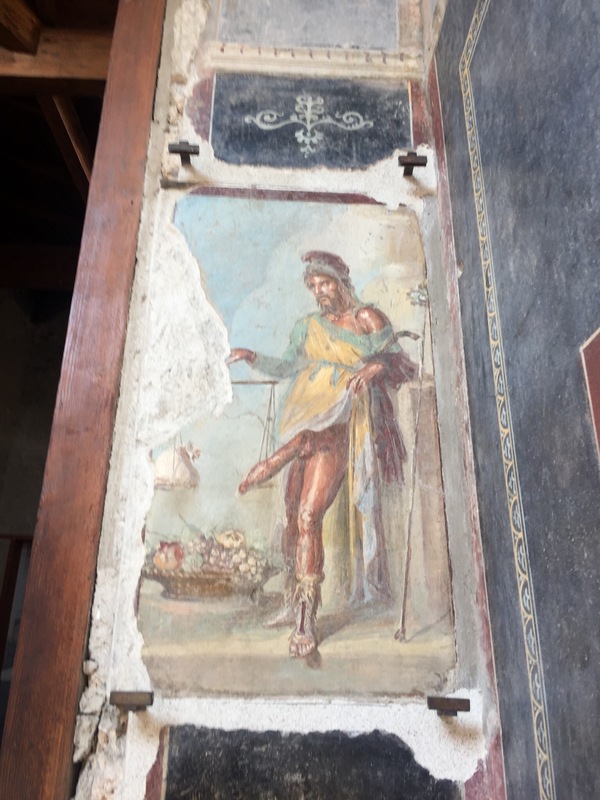 It’s hard not to imagine Pompeii’s people walking around you, going about their daily business. Now it’s one of the most famous Roman sites in the world, and was top of our list of things to see in Italy. The eruption is said to have added so much material that Pompeii’s now over 2km away from the coast. But back then the arriving sailors would come a shore into this seaside resort. The layer of ash did an amazing job of preserving the details of the buildings, from the colourful frescoes to the ornate mosaics. Inside the main city walls, we dodged the curise ship groups and the pesky Japenses talking a selfie every few steps (with 2,500,000 visitors a year you’re going to come across a few) ) as we walked through the paved city streets. 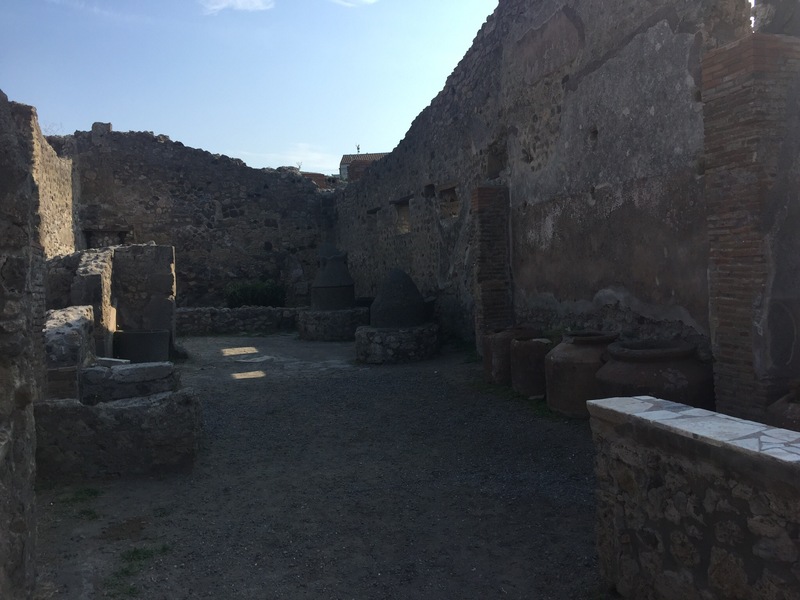 The layout is just as it would have been before the eruption, with private homes mixed in with shops, restaurants, temples, an amphitheatre and even a hotel. 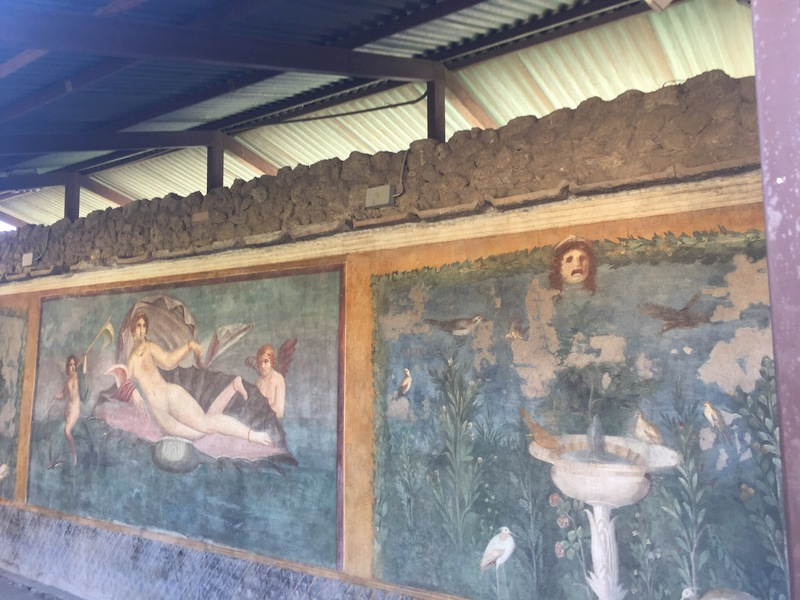 And the extent of the preservation gives an amazing insight into how the Romans lived here. 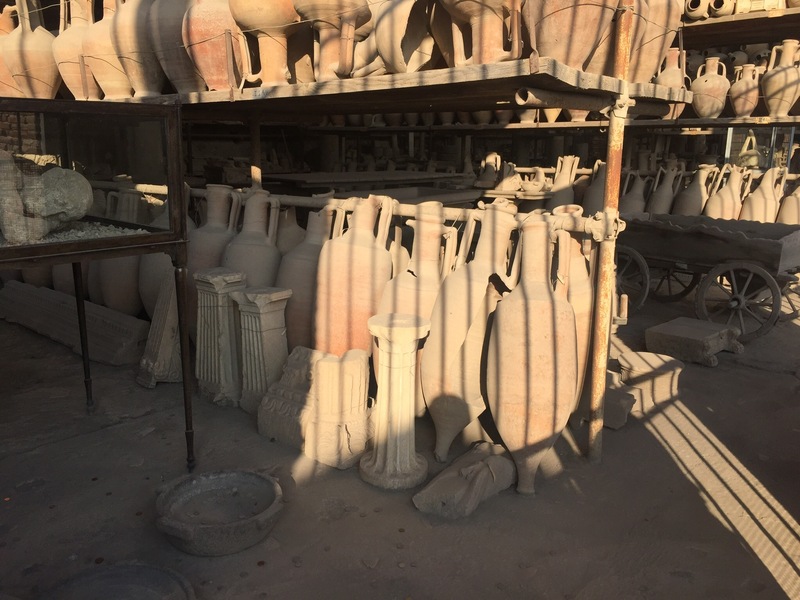 It was quite astonishing to see the amount of artefacts preserved and on display at Pompeii, that array of pots and vases uncovered. I can’t imagine how it must have felt to be on the team that uncovered them all. The scope of this place is utterly mind blowing, and it’s still not completely uncovered., with no set route though the city, your free to wonder in and out of the many buildings, we spent a good 4 hours of solid walking and probably covered about half of the ruins. 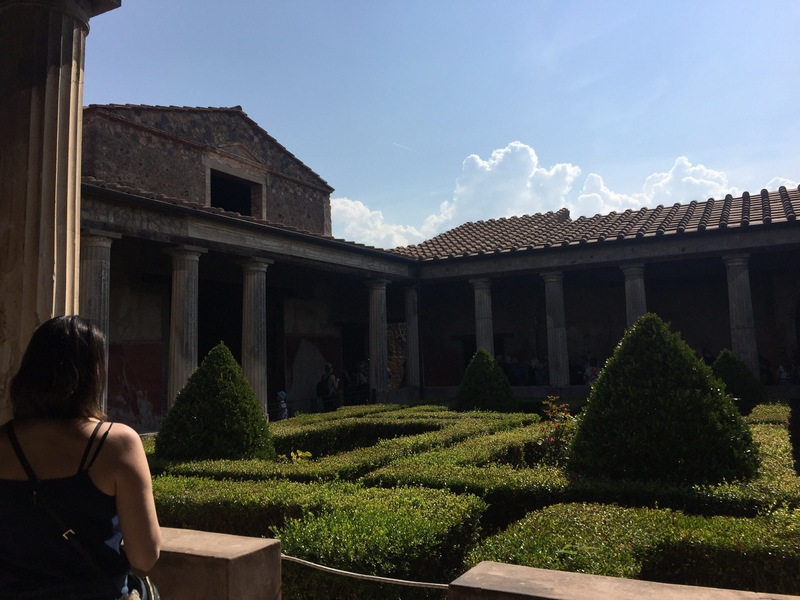 Our final stop of the day, and probably one of my favourite part of Pompeii, was the Odeon, used for musical shows, poetry competitions, singing and performances. Thought to be able to seat 1000-1500 people, the Odeon was roofed so provided much better acoustics for performances. 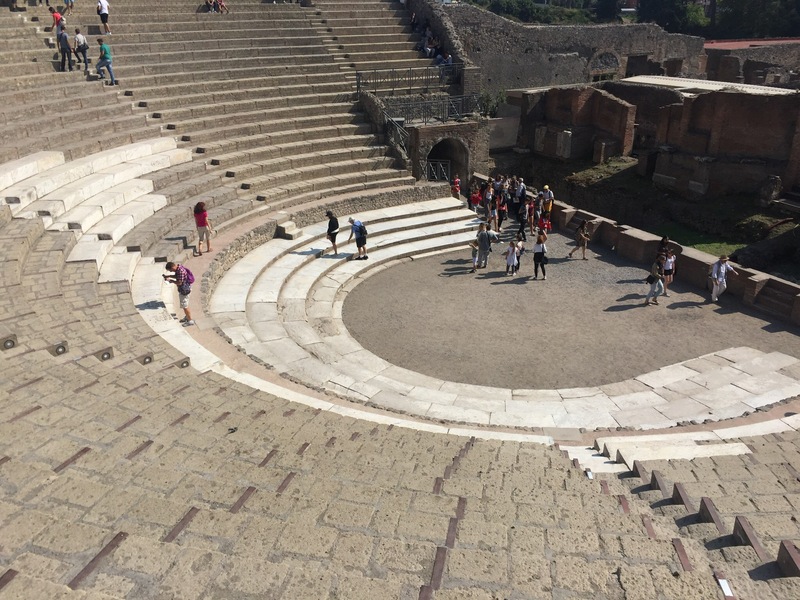 I think part of the reason I liked this part of Pompeii so much was because it reminded me of the Minack Theatre in Cornwall, very near to where we used to live. With the steep, stepped seats, to the maze of behind the scenes corridors leading to secret entrances. ← The refillable gas question?